Blano, remembered by many as Johnnie, was retired from Sears Roebuck & Co in East St. Louis, IL and Fairmount Park Racetrack in Collinsville, IL. Blano was also co owner with his wife of Granda’s Early American Antiques in Trenton, IL. He has served aboard the U.S.S. Ault during WWII as Guners Mate 2nd Class serving throughout the Pacific Theater of Operations including being at Tokyo Bay Japan for the signing of the peace. 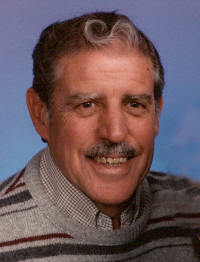 a brother Marino Granda of Addieville, IL. Also surviving are his three grandchildren Tamra Schulte, Jason Granda and Jared Granda. And will be sadly missed by all who knew him. The family would like to express their heartfelt thanks to the many fine employees and volunteers associated with Heartland Hospice and Clinton Manor Nursing Home for their love, support and kindness during this difficult time.